Ever since I was a kid, I always had a fascination with bows. The skill, dexterity, and speed that is required to shoot one is not easy to master, but the pure badassness of it always captivated me. If you have watched The Lord of The Rings, you probably already guessed that my favourite character was Legolas, an archer elf. In this article specifcally though, we will be discussing the Mongolian Recurve Bow, one of the most feared weapons during the Middle Ages. It was an integral part of the Mongolian army and was perhaps the key to winning many battles during the Mongolian conquests. If you are wondering where you could get one, I found these on Amazon. Otherwise if you enjoy some history and want to get some insight into how the Mongolian Recurve Bow is made, introduced to the western world, and how it was used, stay tuned! 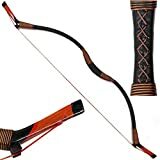 The bow has been around since the dawn of mankind and was actually a primitive weapon that tribes used for hunting and occasionally during tribal conflicts, but with time, the bow came to be one of the deadliest weapons. Since the ancient times until modern warfare, archers served as a key component in army composition and sometimes was the deciding factor for many important victories. The English Long Bow was mostly used during the medieval times in 14th to 15th century. It was deadly when used effectively and strategically; it in fact was one of the biggest contributing factors to winning “against all odds battles”, a prime example being The Battle of Agincourt. Its length stands at about 180 centimeters and is mostly made out of yew (a readily availble resource in England). 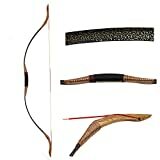 The bow string is either made with flax or hemp and the middle grip handle varied to suit the comfort of the user. Most English people knew how to make the long bow and it could be easily mass produced for very cheap, hence the bulk of the English army during the 14-15th century were comprised of archers. A yew log is chopped and shaped from the log itself and sandpapered. There are conflicting reports on its draw weight, but most historians estimate around 100 to 150 lbs of draw weight and with bodking/armour piercing tips, it sometimes could penetrate medium armour such as the chainmail and weak spots on the full plate armour at close distances. The effective shooting distance is about 200-300 meters and was commonly accompanied by heavy bodkin arrows. 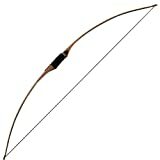 Compared with other types of bows, The Long Bow can shoot at greater distances and has amazing penetration power. The yew tree is pretty common and The English Long Bow could be mass produced easily. Since it’s made out of a full piece of log wood, archers didn’t have to worry much about their bows becoming wet and getting damaged as much compared with crossbows and recurve bows which are glued together. However, due to its size and length, mobility was a disadvantage. The long bow can’t be used on horseback and had to be used on foot. In most of Eastern Europe and Central Asia, the recurve/composite bows were the weapon of choice since there was no “guidelines and rules” for war most of the time and could be wielded on horseback. It wasn’t until when the Mongols invaded Europe that the Mongolian bow became the talk of the town. The main frame comprises of Birch, a ready available type of resource in old Mongolia, and string from dried animal hide. Sometimes for decoration and practical purposes animal horn and bone were used as well. The body is glued together in layers to give it both flexibility and resilience, and the bow is strung in the opposite direction to give it a powerful flick when arrows are set loose. Commercial Mongolian recurve bow is usually 120-140 cm in length and 40-90 lbs in poundage. However there are recounts of it being over 150 lbs during Chinggis’ time. The bow itself is compact enough to be wielded on horseback, yet powerful enough to pierce armour! However, it takes a longer time and it is more expensive to make compared to other traditional bows. The Mongolian recurve bow is also prone to damage if kept in wet and moist environment so it does require some maintenance. According to history, skilled archers could shoot more than 400 meters, and other accounts of master archers who could shoot arrows more than 500 meters. Zurgudai, AKA Zev, shot Chinggis Khaan from a great distance during the battle of the twelve sides. Chinggis fortunately recovered and wanted to know the archer who shot him after his army won the battle. Zev spoke without fear for actions, and instead of being executed, his life was spared for his honesty and great skill; he eventually went on to become a loyal general of Chinggis. Back in old Mongolian era, everyone had to have an understanding and knowledge of the bow. Boys were required to train consistently and learned from a young age to hunt; even women had to be able defend themselves with it if need be. In battles, it was a devastating weapon when used on horseback. Mongolian soldiers sometimes carried more than one bow and different arrows for different purposes, whistling, flaming, and armour piercing. Mongols were known to feign retreats and suddenly turn around to ambush the pursuers or deploy hit and run tactics. Do People Still Use The Recurve Bow? Absolutely! Besides some of the hobbyist who enjoy shooting composite and recurve bows, people living the nomadic lifestyle in Siberia use it for hunting occasions. However, more significantly, Mongolia still keeps its archery tradition with the Naadam festival, which is held every year. How To Shoot The Mongolian Bow? Shooting a bow is fairly easy, since the main action is just pulling the string and releasing it. However, it does require strength and practice to shoot heavier poundage bows. An average person could perhaps shoot 40 pound bows, but anything about that requires some strength training. Use your index and middle finger to grab the string with the arrow in between. Pull the string until it reaches your cheeks and release your fingers. Where Can I Buy or Find One? Seven Meadows Bows has a good collection, otherwise, feel free to check out the ones from Amazon.